One of the benefits of living in the Hyde Park area is easy access to Ault Park with its events, gardens, play areas and hiking trails. I'm at the park almostly daily, with the dogs and camera in hand, exploring the grounds and hiking the trails. Over the years, the trails have fallen into disrepair. A lot of hikers (a very good things,) weather, mountain bikes (not permitted) and misuse (breaking trail or widening the trail) has left some sections in need of attention. I'm sure I've taken a few park goers by surprise as I pounded in exposed rebar or cut back brush that was obstructing the trail, but now trail goers will really see some action. 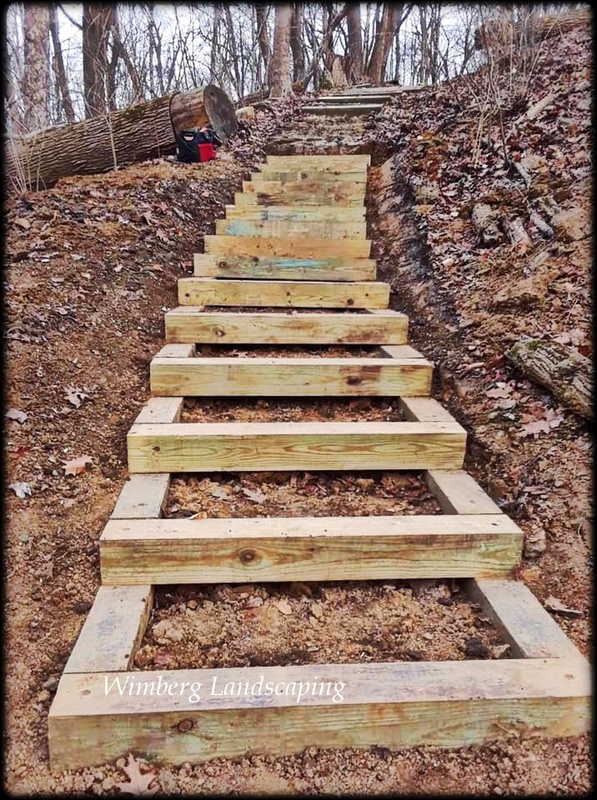 Wimberg Landscaping has partnered with the parks to rebuild a large section of steps along the Tree Trail. New lumber and rebar support is being brought deep into the woods to rebuild the steps. Boards that are rotting or greatly askew and exposed rebar is being removed and the steps reset to create a safer, more pleasant hiking experience. Ault has been a long time recipient of Wimberg’s support with trail rehab, the Adopt -a-Plot focal garden and work along the Viburnum Garden. We are happy to give back to this park that gives so much to our community. But, we shouldn't have all the fun! I encourage you to volunteer for a few hours, a season, or join a a park’s advisory council for a year. It’s a rewarding experience.